There’s a much-quoted statistic that 80% of your wedding’s success depends on the entertainment. This may or may not be true but there’s no doubt that a lot of great wedding memories are made on the dancefloor. That’s why you need to give some serious thought to your choice of wedding DJ when planning your big day. You want everyone to be dancing, your friends and family all having an amazing time, guests being magnetically pulled to the dancefloor when they hear the first bars of a song they love. We all know what it feels like when your feet just won’t stop moving! This means that the DJ needs to play the right tunes to keep people dancing. What those tunes are depends on your music tastes and those of your guests…not the personal music tastes of your DJ. Some DJs are into trap – your 14 year old nephew might be as well, but the majority of guests aren’t likely to be. A good DJ will be able to assess the crowd and, using her experience, will have a good idea of what will get them dancing. To reduce your chances of bad song choices, make sure you give your DJ a must-play list when you have your first meeting. I recently played at an event where there were four DJs on the line-up. 3 of them (including myself) had put a lot of thought into our song library before the gig, making sure we had the rights songs for this type of party. When we got there, we went with the flow by reading the crowd and selecting and mixing our songs based on what we thought they would enjoy. It was a great success. There was one DJ, however, who loaded up a mix which had been prepared by a well-known superstar DJ. She pressed the play button and that was her set for the next two hours. No preparation, no reading the crowd. Most of the crowd stayed and danced – it was true – and there’s an argument that that’s all that matters. But it’s risky as it leaves you with no flexibility if the crowd doesn’t like your pre-prepared mix. Personally I couldn’t help but feel cheated if I was paying a DJ good money to press play on someone else’s mix. It’s far better to find someone who plays with pride and skill – I think it shows. DJing at a wedding isn’t just about playing music – it’s also about knowing your equipment well and being able to find a solution if there’s a technical problem. And if there’s no solution to be had, it’s about finding a Plan B. Choosing a DJ who blames the venue/speakers/Gods for technical issues without going the extra mile to resolve the problem isn’t worth the money. We all know that life has a funny way of putting a spanner in the works at times. That’s just how it goes. The important thing is how you react to the problem. Make sure you find a DJ who wants the music to be as great as you do. As you can see, there are plenty of bad DJing habits that you want to steer clear of. 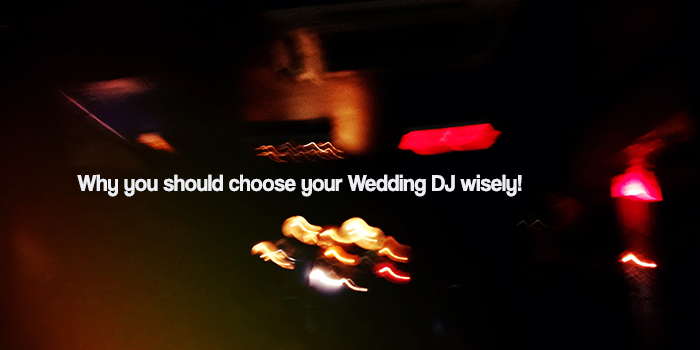 Make sure you choose a reliable and professional wedding DJ (find how to do that here). If you find one who doesn’t see your wedding as an opportunity to get drunk or make easy money by putting in the minimum preparation, you raise your chances of having the best possible music on your wedding day. Do you have any wedding DJ horror stories that you can tell us about to help others to avoid the same mistakes. Share them in the comments below. 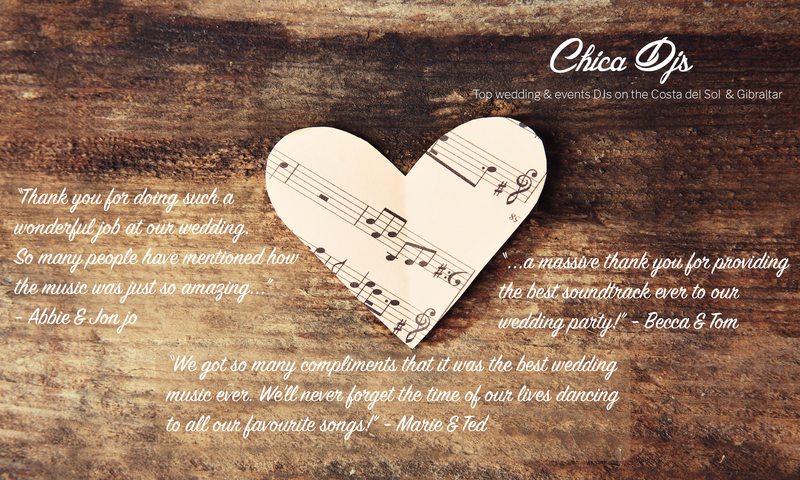 And remember to like Chica DJs Facebook page to stay updated on all things wedding and DJ! Are you looking for a wedding venue in Andalucia? How to choose the right DJ for your wedding! Female DJs – a round-up!